There really isn't anything I could say to encapsulate just how breathtaking this book is. It was heartbreaking yet beautiful, powerful but in a subtle way. It's a story about self discovery and the choices that define us. It follows Parker and her journey to finding answers to a town mystery and, along the way, finding herself. 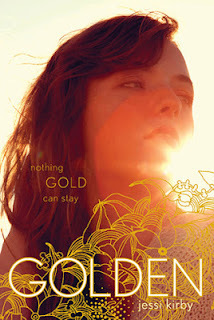 Golden is probably one of the most well written Young Adult contemporaries I've read thus far. The story was told in a steady pace with a cast of relatable and well written characters. What made me fall in love with Jessi Kirby's writing was how Julianna's journal was written. There's something about the insightful way in which she tried to describe herself by describing the love of her life, Shane. But as Parker went deeper into Julianna's story, we're given a view of how her life took a turn by just one momentous meeting. I wasn't prepared for the rush of emotions I felt with every journal entry. Perhaps it was the idea of reading the words of someone who has passed or it was simply Kirby's impeccable writing (or both) that made something so simple stunning. And it isn't simply about a journal anymore because everything that takes place in the book, every choice that Parker made from the moment she decided to take Julianna's journal, is anchored on it. I loved Parker's transformation throughout the book. She wasn't the kind who took chances on anything because she already had her life mapped out for her. But as the story pushed forward, she learned that chance is everywhere and it's also what life is made of. She learned from the words written in Julianna's journal and lived it. Parker took more risks and did what she just knew she had to do. I think the only thing I didn't like so much about her was how strongly she fought for love and fate towards. She got so caught up in how she wanted things to turn out that she refused to see the implications of what she wanted to happen. But in the end, I still like her. She grew up and made choices that she wasn't sure of but hoped that in ten years or so, would matter. This book had its fair share of cheese though. Names like Orion and Hope, and repeating the Mary Oliver quote 'Tell me, what is it you plan to do with your one wild and precious life?' over over again ticked me off a little bit (just a little). But after having read everything, I have no complaints. I guess it mixed perfectly with the story that I couldn't rate it anything below 5 stars. Golden is a compelling story that leaves the readers something to ponder on, dares the readers to make a life altering decision no matter how scary it seems. It's a perfect coming of age novel that says so much without saying a lot and undeniably leaves a lasting impression. Jessi Kirby is the author of Golden, which will be released in May of 2013, Moonglass, In Honor. She is also a former English teacher and librarian, wife, mom, beach lover, runner, and lover of Contemporary YA, strong coffee, and dark chocolate. In that order. FIVE STAAAARRRSSS MUST. READ. THIS. ASAP.